Numbers of moths in the trap have dropped off over the past week and there is a predominance of "brown" apart from the yellow of Brimstones and and Sallows. Autumn feels like it is here. 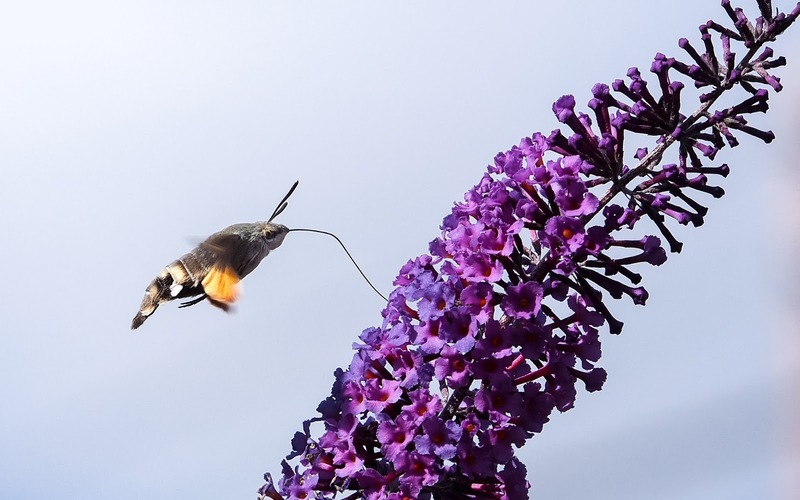 So I was delighted to come across this Hummingbird Hawkmoth nectaring on the Buddleia and even more delighted to have my camera at hand. A bit of a tricky customer to photograph flitting from one flower head to another and there were very many other shots that went straight to trash. 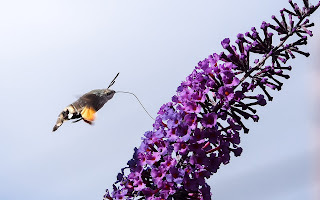 We have four Buddleia bushes, two purple and two white and interestingly the HHM only went on the purple often flying past the white bushes to get to a purple one despite the white having the more and fresher blooms. The attendant butterflies were not so fussy but were favouring the white. Great photograph Pete! We have had two sightings here in our Halesowen garden this year but they were very brief, certainly no chance of any photographs. Thanks Patrick, this was my second sighting as well, saw one in mid July very briefly. I was just lucky to have may camera to hand this time. I have to second Patrick's comment: That is a superb photograph. Thanks Andy. There was a lot of luck involved! I was just pleased to be able to get a shot.